Today we have enjoyed the visit of two of our patrons, John Beale, who has paid for the bulk of the 2010 and 2011 staff and equipment costs and John Osborn, who has sponsored student placements in both years. 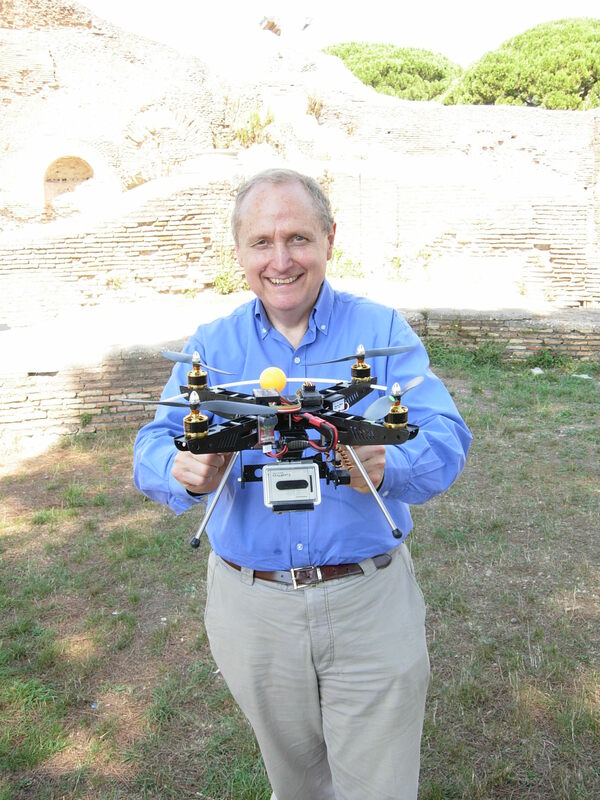 John Beale’s donation this year included provision for a photographic helicopter, to take aerial shots of the excavated areas (one step better than a photomosaic). Last year such a craft, piloted by Christian Krug, revealled many features, notably a line of post holes around our small temple in the palaestra. Following the arrival of our new helicopter, Joe Williams put particular effort into training for this as a ground-based pilot, using computer simulations prior to putting the craft into the air, spending many hours with the control box attached to his laptop. After several days of experimenting on site, Joe finally did get the helicopter airborne, in time to give John Beale a demonstration and to take some initial shots of the palaestra. However, our enthusiasm got the better of us, and around lunch on Saturday disaster struck. The helicopter went a good 100m into the air, far higher than we intended, and then a sudden gust of wind carried it far beyond our part of the city. Joe was inconsolable, and a search by the whole team proved fruitless. However, today we located the craft, in four pieces, in the necropolis, on the southern side of the city. It seems that we will be able to repair the vehicle, as only the frame appears to be damaged. Tomorrow Alex Sammut will make an inspection of all pieces and we hope to soon have it flying again. Nevertheless, we have learnt our lesson, and will not be taking it out until the high winds of the last few days have subsided. We are grateful to John Beale for the purchase and hope to have some shots of our study areas for the final report using this craft. For the moment all three sites currently under excavation are revealing a wealth of interesting features about which we will update you shortly.